Sweet Coconut and Zesty Lime handmade soap will make your remember that song about the lime in da coconut. A tropical beach party that's cool and refreshing for your bath or shower. Sweet Coconut and Zesty Lime handmade soap will make your remember that song about the lime in the coconut. This is the handmade, artisan soap version of the same thing. 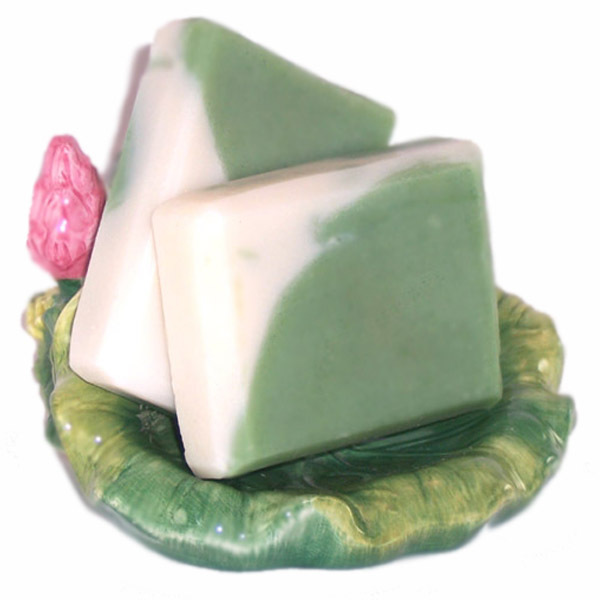 This hand crafted soap has a zesty splash of lime and perfect note of sweet, fresh coconut. This soap is very cool and refreshing, like a tropical beach party! These smaller bars are perfect for the kitchen or the bathroom sink. This way you can try another soap with a different fragrance anytime. Coconut Lime soap will clean thoroughly yet gently without stripping the skin of its natural moisture balance. It will leave your hands lightly scented. Each soap is made with the cold process method and has beautiful green and white swirls in each bar. This makes each coconut and lime soap unique. A well cured handmade soap will last longer in your shower or a bath, but due to natural glycerin in the soap, it’s best to keep each bar in a slotted soap dish that drains. Your soap will arrive in a soap box with a full ingredient list, so it’s suitable for gift giving for any occasion. Buy one or two for a birthday, baby shower, Father’s Day or Mother’s Day. Ingr: Olive oil, Coconut, Palm Kernel, Shea Butter, Castor oil, Soybean, Sodium Hydroxide, Beeswax, Sodium Lactate, Fragrance, Lime oil, Green Oxide, Titanium Dioxide.